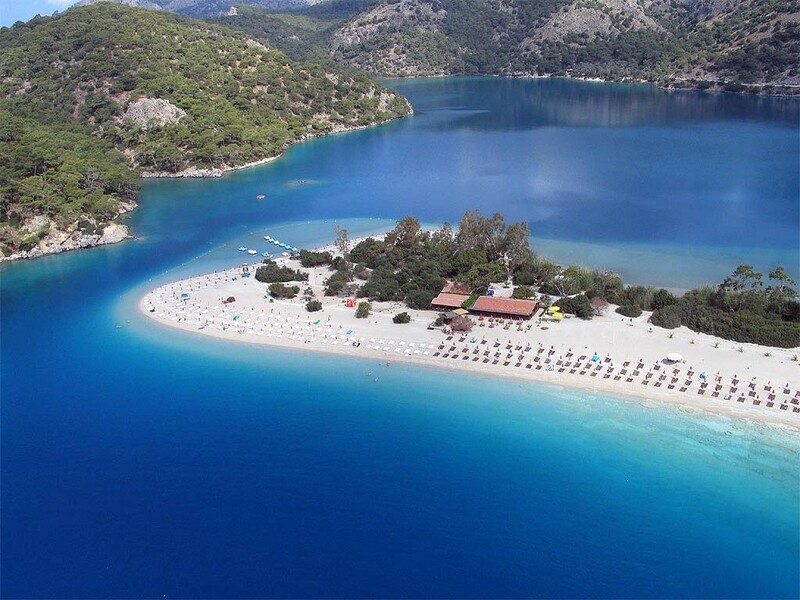 Medsail Holidays is an expert adventure travel / eco-tourism tour operator for unique and pleasant tours in Turkey. We provide quality services for individuals, families and small groups to the "off the beaten track" areas of Turkey, as well as, the "popular, can't miss it" spots. We customize unique sightseeing, history, archaeology, flora, sailing, hiking, walking, diving, biking, trekking, culinary experiences, combining learning, relaxing and stretching your muscles a bit. Sailing along the Turquoise Coast, hiking between coves as the ancient people did, walking the most picturesque trails, admiring spectacular views, meeting and getting to know the real people of the country, staying in local homes, eating a great variety and quality of the world known Turkish cuisine, certified and specially trained professional guides, authentic and characteristic hotels, incredible flora of Turkey are the highlights of Medsail Holidays trips. 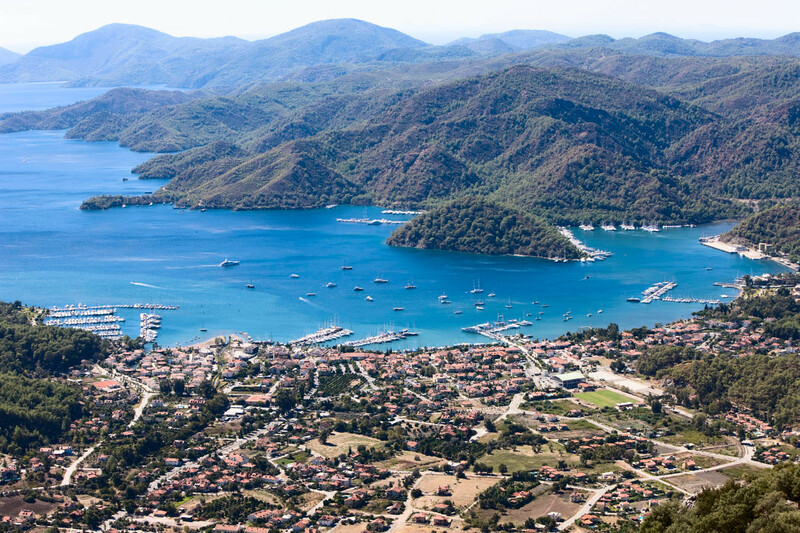 We meet the captain and the crew and cruise to a quiet cove in Fethiye Gulf where we spend the night. 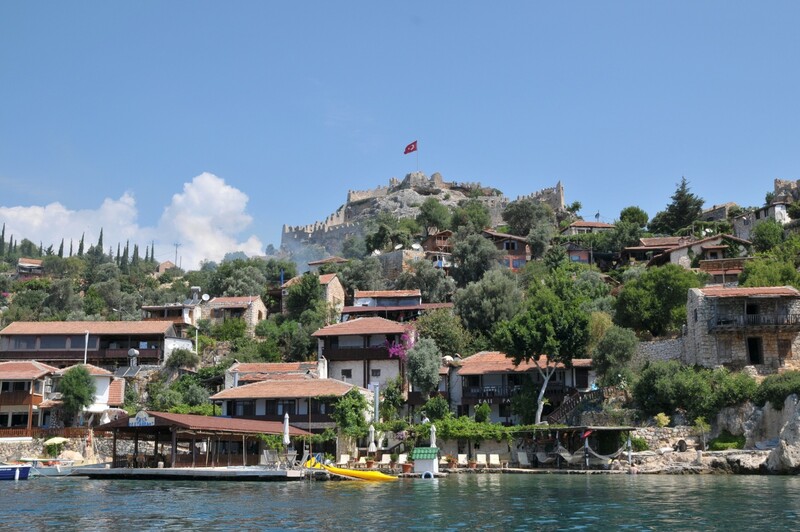 In the morning we cruise to Batik Hamam (Sunken Bath) cove. The cove has a Roman bath about five feet under water . It is said to be the place where Marc Anthony and Cleopatra have dated. Late afternoon we hike (3h) to Binlik cove. This is a great hike with spectacular views of the Mediterranean , partly through breezy pine forests. On the way we visit the Lycian site of Lydae, which is accessible only on foot. We anchor the night in Binlik cove. Extracurricular activities: Hiking 3 hours. Sites visited: Sunken Roman bath, Ancient Lydae. 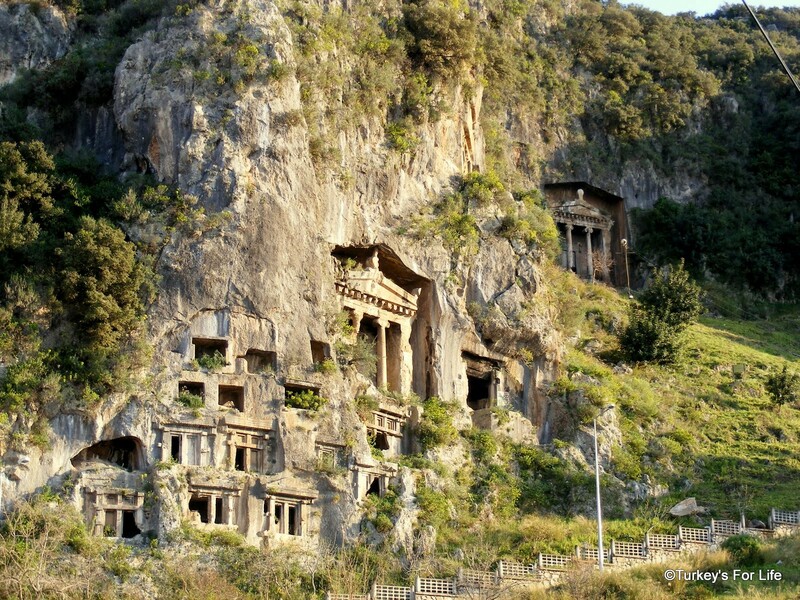 We visit the ancient necropolis of Telmessus (Fethiye) to see the spectacular temple type rock-cut tombs. 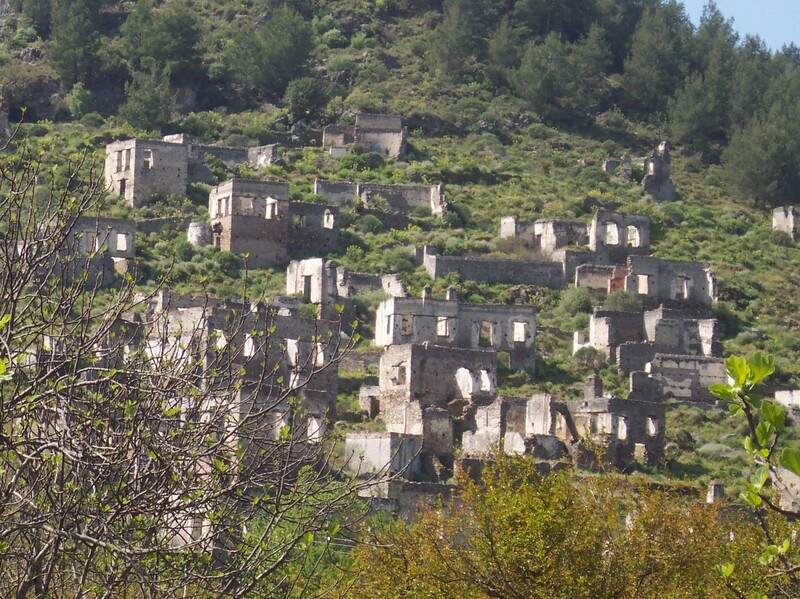 Then we take a 15 min.ride to the deserted Greek town of Kaya, which was abandoned by 1930s as a result of the population exchange treaty between Turkey and Greece . A very picturesque hike (1 ½ h) takes us to our boat in Soguksu Cove. 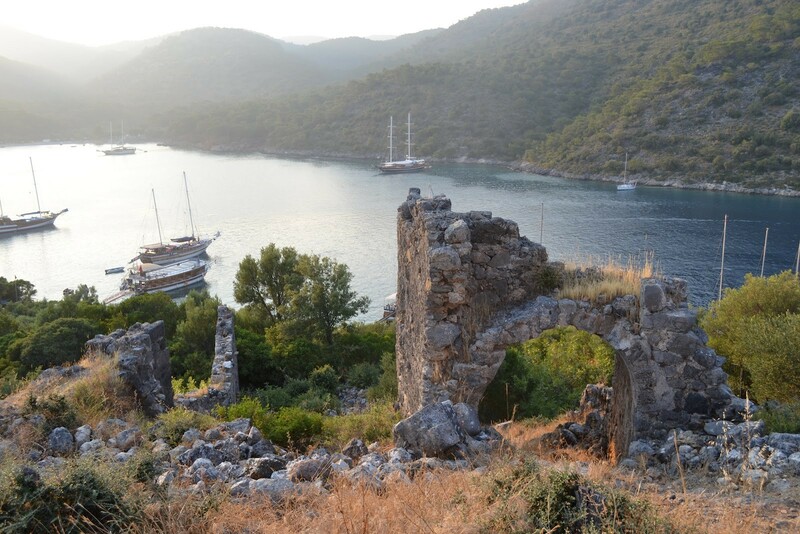 There is a short hike (1 h) on the Gemiler Island where we can see the monastic Byzantine ruins and watch the sunset. Extracurricular activities: Hiking 2 hours. Sites visited: Deserted Greek town Kaya, Byzantine monastic island of Gemiler , Rock tombs of Fethiye. We start very early to Kalkan. After breakfast we take a hike (1h) to a panoramic spot, where we meet our land transport to a modern time Lycian village. Here we walk this village and join the locals for lunch. It is a short drive to Kas, once a quiet fishing village, now quite a popular, but still a nice resort. After some private time to relax, we meet for a sip of Turkish wine at the ancient theater for sunset. Extracurricular activities: Visiting locals at Mediterranean mountain village, hiking for an hour. 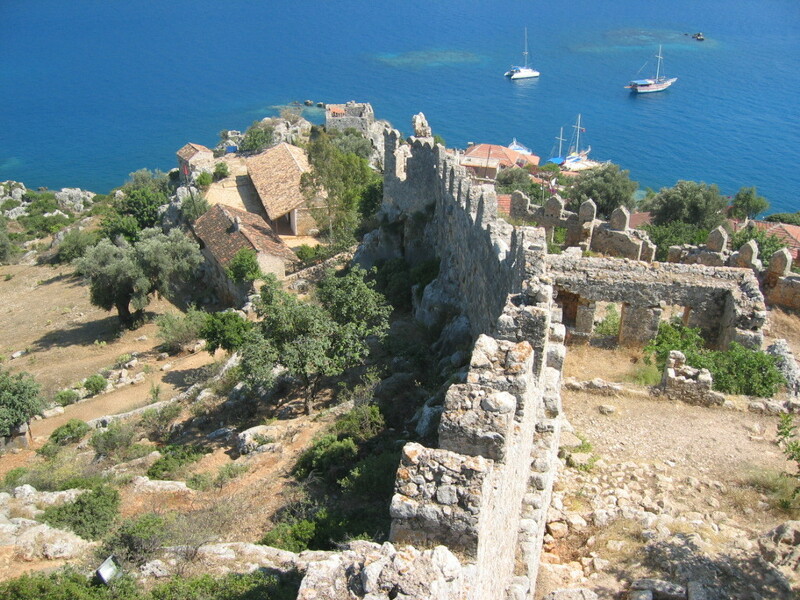 Sites visited: Ancient theater of Kas (Anti-Phellos). As soon as we are clear the customs we cruise across to Meis (Kastellerizo). 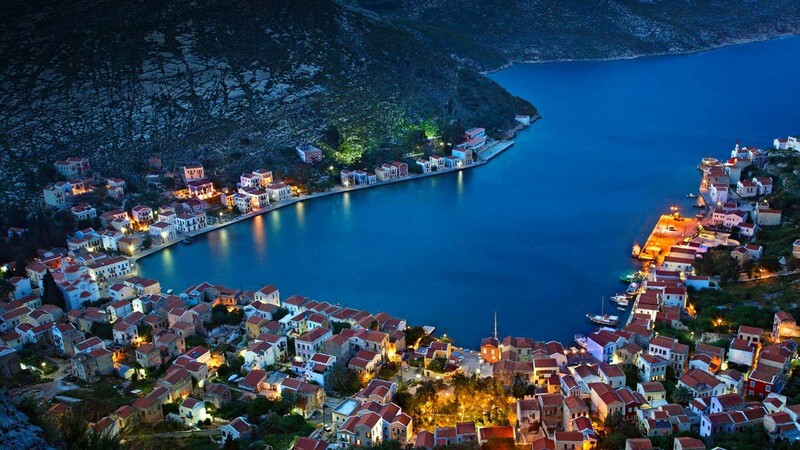 Meis is one of the Dedoconese Island, way west of everything about Greece, about a 1000 miles from Athens. Meis is very small, cozy and pretty. 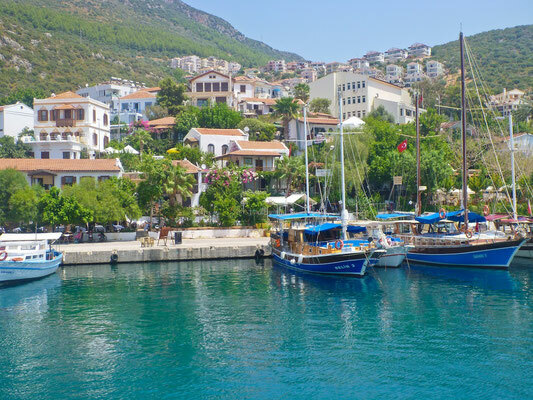 One can stroll around for a couple hours to see around, small museums and typical Greek Island lifestyle and nibble on some mussel saganaki and calamaris at the harbor and have a glass of ouzo. 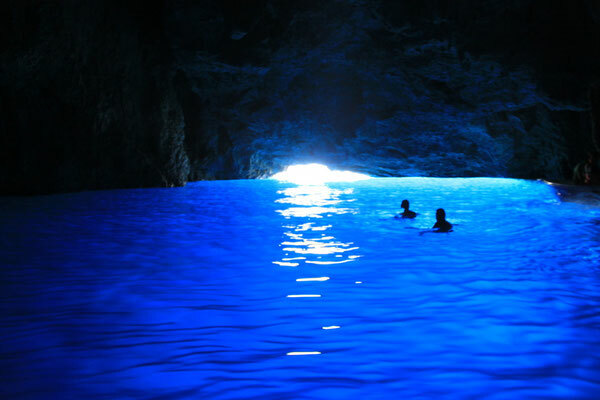 If the weather permits, we visit the spectacular Blue Cave on the east side of the island. Extracurricular activities: Visit the Blue Cave. Sites visited: Museum, Old Mosque. 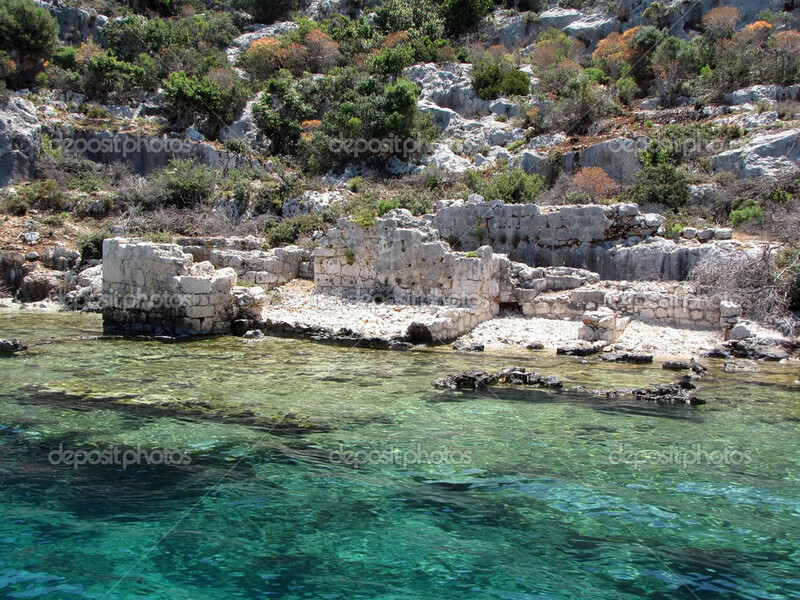 We cruise to Aperlai, where we can snorkel over sunken ruins. We can see marble columns, paved floors, walls, and the foundations of a church, possibly one of the earliest churches in Turkey . 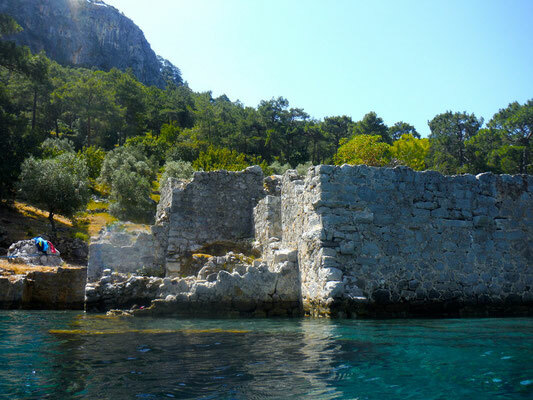 Then move into the Kekova Sound. In the afternoon we cruise to a well preserved cove then hike (1 ½ h) to the remote and impressive site of Simena. Simena has no road access. It has Lycian origin, but the acropolis is capped with a medieval castle from the Crusades. We tie to this little ancient village for the night. Extracurricular activities: Snorkelling over sunken ruins in Aperlai, hiking 2 hours to Simena. Sites visited: Ruins of Aperlai, ancient Simena. After a morning swim, we cruise to Cayagazi to meet our van for trip extension or transfer to Antalya Airport to fly home.